Posh packaging for your very special veg! Printed on one side with the legend "Produce! From the garden", and on the other with "Compost! For the garden". Made using genuine antique wooden lettering and traditional hand operated presses, each one is a veritable work of art – the perfect way to package up your garden surplus gifts! Twelve bags on stripy red and white string, complete with a sweet printed tag. 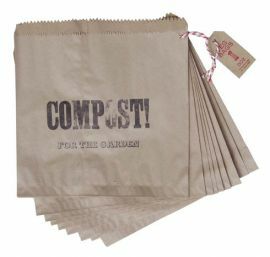 TOP TIP: The Centre for Alternative Technology recommends adding a certain amount of paper to your heap to get the very best compost – and if you use these groovy bags, it's all done automatically! Keep a string in the shed and one in the kitchen, for the perfect kitchen/garden system.